Usami's previous name was Yume. I think Usami fits her better. Usami is a HDD-06 painted by Alan Kan. I got her from eBay. She came with a pair of eyes, which will not be her current eyes. 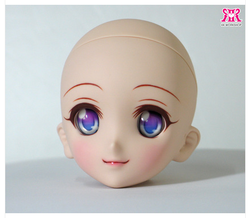 Her current eyes are a pair I got from Kyoukori @ figure.fm. Her hair used to belong to Aldrin, a Leeke limited color. Usami's body will be an MDD with M bust. Her hands would probably be 02 or 05. As you can probably guess, Usami is a little bit of a tomboy. I'm sure once she has a body, she will tell me more about herself. I feel she is full of energy and you can't force a character on her, she will make you change it!